The Light of Truth Center, Inc. (LTC) is a non-profit organization that embraces a new innovative, three-phase process of recovery, transition, and restoration. We are an innovative residential and outpatient therapeutic treatment program providing the necessary tools and techniques to aid recovering women with the life enhancing skills they need to succeed in their recovery journey. Our unique three-phase process substantially increases the probability of each participant’s success and sustained restoration. Our innovative programs provide participants with an opportunity to re-examine and assess their lives from a spiritual perspective. 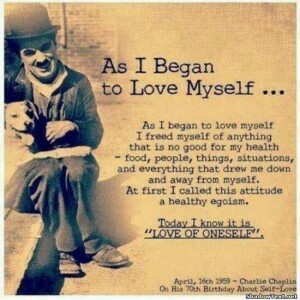 This approach has its roots in the Twelve Step recovery programs. The spiritual components of this program are: honesty, hope, faith, courage, self-integrity, willingness, humility, brotherly love, justice, perseverance, spiritual awareness, and service. Additionally we use a “Quality of Life” model approach that has been substantiated to suggest that sustained recovery over a period of time is directly proportional to an individual’s perception of her quality of life. Our approaches build on these and other evidence-based strategies to better support a women toward her vision of a life reclaimed, rebuilt and fulfilled. Believes recovery is possible and every woman has the right to recover. Believes all souls can heal. Stands on integrity and does everything in a spirit of genuine love and compassion. Holds the vision of what’s possible for a woman until see can see it for herself. Serves the needs of women in a holistic manner and provides a safe space for the recovery of the physical, mental, and spiritual aspects of a woman. Honors the dignity and esteem of all women. Gives women the choice and opportunity for a new way of life. Loves a woman until she can learn to love herself. Believes women are people and not statistics. Believes all women possess positive life skills that unfold through recovery, transition, and restoration. Provide safe, clean, and affordable housing conducive to recovery for women. Residents complete a battery of assessments upon entering LTC. Assessments are designed to identify resident challenges and areas that require attention and further support services. Residents are then referred to aftercare programs and other support services that support and enhance a resident’s recovery process. Peer to peer facilitated recovery groups provide support and an open forum for addressing issues surrounding recovery. Women have social and economic issues that pose a challenge for them in recovery, including childcare, personal relationships and family obligations. The peer group allows women to support each other and share their experiences strengths and hopes. After leaving treatment, detox and other institutions, many recovering addicts require additional support in applying recovery tools and techniques. New recovery skills have to be further developed in order to effectively implement tools of recovery in everyday situations. Relapse prevention is an important tool for women recovering from drugs and alcohol. Learning one’s triggers (things that trigger the craving for drugs) and recognizing old addictive behaviors can make a tremendous difference in the success of a recovering women. Teaching relapse prevention skills allows our residents to make better choices. Many women relapse after leaving treatment and detoxification. The family imposes many social obligations on women. Though a woman is just leaving treatment many families, children and husbands want their mother or wife back. Many women are not able to care for themselves much less assume a role of nurturer. LTC works with the family to help them understand the disease of addiction and the task of recovery before their loved one. In addition, LTC encourages the family to be supportive and to become informed about recovery concepts. For the past 60 years, Alcoholics Anonymous (AA) has been the most common and often the only form of care for alcohol and other substance use problems. Of the various mutual assistance groups, including Smart Recovery and Narcotics Anonymous, AA is by far the most widely available. AA meetings include frank, open, honest discussion about all aspects of dealing with recovery – both the pains experienced during periods of substance use and the positive experiences brought by recovery. Narcotics Anonymous sprang from the Alcoholics Anonymous Program of the late 1940s, with meetings first emerging in the Los Angeles area of California, USA, in the early Fifties. The NA program started as a small US movement that has grown into one of the world’s oldest and largest organizations of its type. Today, Narcotics Anonymous is well established throughout much of the Americas, Western Europe, Australia, and New Zealand. Newly formed groups and NA communities are now scattered throughout the Indian subcontinent, Africa, East Asia, the Middle East, and Eastern Europe. Narcotics Anonymous books and information pamphlets are currently available in 34 languages, with translations in process for 16 additional languages. In many ways, the most difficult part of establishing and maintaining long-term recovery begins after the initial, intensive part of treatment has been completed. Aftercare programs help to prevent relapse. Most recovering women need to be in a warm supportive environment. Aftercare programs are generally six months in duration and provide additional support during the transitional process. 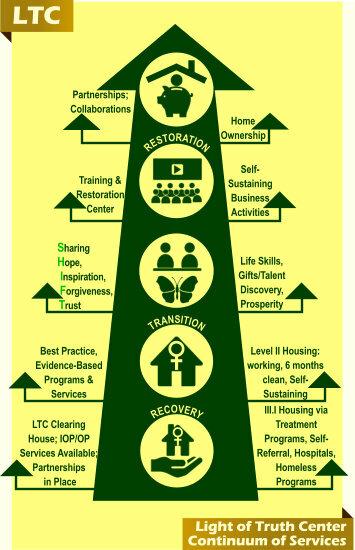 LTC’s Life development plan is a long- term segmented plan developed for residents to rebuild their lives step by step. Many women enter the center without personal identification, interpersonal skills, or GED certificates. They also are not prepared for long-term employment. The Life Development plan steps our residents through a series of phases until they have completely prepared themselves for full restoration.